Trump has speculated that he could appoint a majority of the nine-member court. But it has been three decades since a president has been able to name more than two justices to their life-tenured posts, and Trump tied that number this week. Trump has speculated that he could appoint a majority of the nine-member court. But it has been three decades since a president has been able to name more than two justices to their life-tenured posts, and Trump tied that number this week. The court’s oldest remaining justices, two liberals and a conservative who are 85, 79 and 70, haven’t suggested they’re going anywhere and appear in fine health. That hasn’t stopped Trump and others from predicting more openings. Five would still be a far cry from George Washington, who named the entire first Supreme Court and ultimately made 11 appointments. Franklin Roosevelt, with his unparalleled four terms as president, made nine. With Senate Republicans holding open the seat of the late Justice Antonin Scalia until after the presidential election, Trump was assured his first pick even before he took office. Senators quickly confirmed his nominee, Neil Gorsuch. 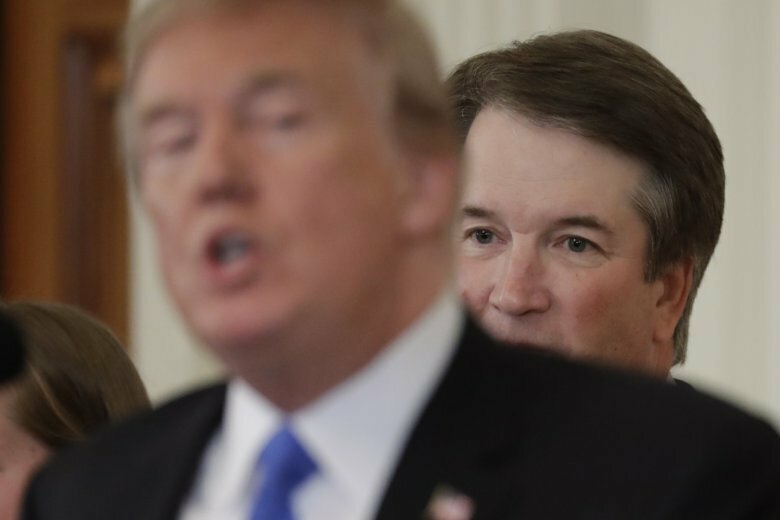 With the Senate still under Republican control, 51-49, it would seem Trump’s second choice, Brett Kavanaugh, is on his way to replacing retiring Justice Anthony Kennedy. The last president to fill more than two Supreme Court vacancies was Ronald Reagan, who filled three. Reagan chose Scalia, Kennedy and Sandra Day O’Connor, the first woman on the court. He also elevated William Rehnquist from an associate justice to chief. Ever since, circumstances have meant that presidents have been able to fill just two openings each. George H.W. Bush put David Souter and Clarence Thomas on the court in his one term in office. Serving two terms didn’t help his successors get more picks. Bill Clinton chose Ruth Bader Ginsburg and Stephen Breyer. George W. Bush selected the court’s current chief justice, John Roberts, and Samuel Alito. Barack Obama named Sonia Sotomayor and Elena Kagan. Clinton and Obama, like Trump, found themselves with open seats in their first year and a half in office but never got to fill another opening. While Scalia’s unexpected death in 2016 gave Obama a chance to nominate a third person to the court, Senate Republicans refused to give the Democrat’s nominee, Merrick Garland, a hearing. Trump could run into the same problem if Democrats re-take control of the Senate in November. “In the wake of what happened with Merrick Garland, Democrats would feel justified in refusing to seat another Trump appointee. That would certainly be on the table,” said Frances Lee, a professor of government and politics at the University of Maryland who studies Congress. Recent justices have tended to retire under a president of the party that nominated them. The next oldest Republican-appointed justice on the court is Thomas, who at 70 could serve for another decade or more. Kennedy announced his retirement at 81. The last justice to retire before him, John Paul Stevens, left the court at 90.